Quetempo is a receiver / broadcaster of sounds / ideas / visions / social narratives. It is a free association of individuals / units / collaborators / instantaneous devices. A multitude of frequencies / of decentralized autonomous departments. Quetempo is a red & black label. Biomass started in Italy working in / with various forms: minimal ambient_skelectrical dub_ political ideas _ an an alchemy of found sounds mixed into his own sonic atmospheres. Dj / producer / programmer, Biomass has played in festivals, squats, clubs & social centres. Biomass will be presenting Market, his latest audio-visual work, a hybrid of repetitive minimal soul cut with electrical sonic atmospheres streaming in parallel with sub bass & crashing lyrical lines & accompanied by a non-linear television image sampler. Electroware is a composer, producer and sound engineer who has been working in Athens on various projects since the late 80's. 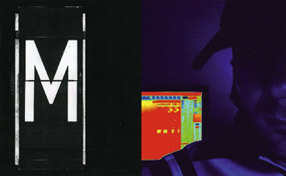 He has produced, among others, influential sonic collectives such as Drog_a_tek and The Erasers and he has mastered works by Biomass and Monochrome. Electroware is also the mastermind behind the Quetempo record label. Electroware will present his new work which is based on sonic formations that flow between minimal sonic materials such as hidden melodies and minimal drones and peak towards abstract beats and noise infused soundscapes. Poeta Negra Records originated in the 90s in Thessaloniki, Greece, where it is still based. It aims to detect the latest trends of musical evolution in terms of form & function within the boundaries of electronic and in a broader sense contemporary music, where sound & form accompany the new realities of a continually evolving urban environment. Spyweirdos has been involved in many sonic projects including soundscapes, mastering & music composition since the early 90s. 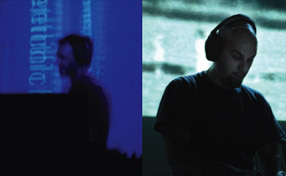 Collaborators include Alva Noto, Murcof, B. Fleischmann, John Mourjopoulos & Metropol. A physics post-graduate, he is currently doing a phd on acoustics (noise reduction/noise control). Breakbeats have a leading role in the narration Peekay Tayloh unfolds, while ambient atmospheric sounds and jazzy passages are often enhanced by noisy sounds and idm rhythmic orientations. Tayloh's material is inspired by urban routine, with neurotic peaks and sensational extensions and his work functions as a modern urban soundlandscape.